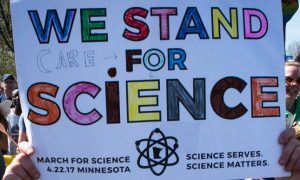 Rally for Science May 19 with other Minnesotans concerned about science funding, education, public health and environmental stewardship. This event, organized by March for Science MN, will be at noon in Mears Park in St. Paul. It will include activities to engage families, educate the public and raise awareness of our needs to lawmakers. Learn about our initiatives; meet with lawmakers, our partners and your neighbors who care about science; and learn what you can do. Help gather support for the policy changes needed to sustain a healthy public and a healthy world.